We picked the best disposable bouffant caps on the market to offer our customers, and you can enjoy the lowest prices on regular, pleated, micro-porous or Tyvek white bouffant caps from Harmony. These comfortable-fit hair cover caps keep hair out of the way to protect work areas from contamination. They're lightweight, but strong, which makes them ideal for pharmaceutical, medical, food processing or food prep and industrial purposes. 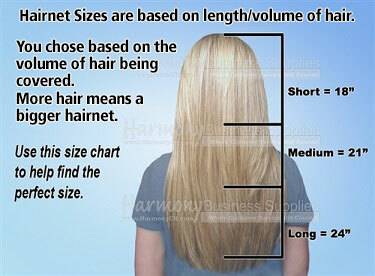 With our bouffant size chart, it's easy to find the right sizes for all staff members. Not sure which size to order? Click here for bouffant size chart. All our white bouffant caps are FDA-approved hair restraints with latex-free elastic headbands. The non-woven polypropylene construction keeps heads cool in hot work areas. We also carry Keystone's FDA-approved pleated disposable bouffant caps. Pleated bouffants are easier to store and to dispense than bagged bouffants. They're a go-to choice for use in clean rooms. Microporous bouffant head caps are made from a breathable fabric that's ideal for long days in hospitals in clinics. These microporous bouffants guard against dirt, dust and non-toxic liquids. For maximum protection Tyvek bouffants are the best choice. Our Tyvek bouffants are tear resistant, and ideal for wet and dry conditions where superior barrier protection is needed, making them ideal in cleanrooms.